The ball mill is widely applied in mineral classification, cement, fireproof materials, glass, pottery, chemical industry and so on. 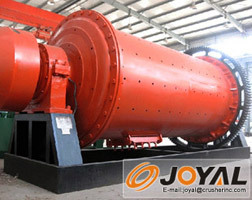 The ball mill can grind all kinds of rocks and grinding materials. There are two ways of grinding: the dry process and the wet process. Ball mill can be divided into lattice type and overflow type according to different beneficiation methods, and this machine is two lattice-type ball mill. The materials from the feeding fittings enter evenly to the first bin of the milling machine via the feeding hollow axis when it works. There is a ladder-like or ripple-like scaleboard in the first bin, and different specification steel balls are installed in the bin. When the cylinder rotates and produces centrifugal force, the force carries steel balls into a certain height and then makes them fall to strike and grind the materials. After coarse grinding in the first bin, the material then enters into the second bin via a single layer partition board. There is a scaleboard and steel boards in the second bin, so the materials are further ground. In the end, the powder is discharged by output material board. This kind of machine has advantages of easy operation, convenient maintenance and reliable performance and so on.